... one yard of this beautiful fabric by Maywood Studios! Isn't it obvious I am looking forward to Spring? Flowers are in everything I am working on right now. 1. Leave a comment answering this question: What lightens your mood on a grey winter day? This giveaway will close March 14 at 5 pm. The randomly chosen winner will be announced on Friday, March 15, here at this blog. I will ship internationally, too! Good luck, and have fun checking out all the blogs! Hi! On a gloomy day; I get busy in the sewing room. Nothing like a little inspiration to pick up the spirits! I am a follower...thanks for this chance. Sewing always lightens up my day. Also listening to music, preferably by my fave bands/singers. Or if it's one of those weekdays when one of my fave series is on TV. Thanks for this giveaway, I am one of your already existing followers ;) lol! On a dreary day, I love to look out my window and watch the birds at my feeder. They don't care that the sun isn't out! On a dull winter day, nothing is better than turning on the Ott lamp, starting to stitch and putting on some Brazilian jazz. At least one can pretend it's warm out listening to that! Looking at all the beautiful fabric lifts my gloomy days. cleaning!!! well it always brightens my mood, but for soem reason more so on a rainy day... followed by some yummy lemon bread and a nice cup of tea after to relax. I actually love grey wintery days! Reading a good book lightens my day. Thanks for the giveaway! Gloomy day? Grab a good book and curl up in a warm quilt and read away! Gorgeous fabric. Thanks for the Giveaway!!!! I love gloomy days! We don't get many in Florida. Gives me an excuse to stay in and sew! I am one of your followers. Again, thank you for the great giveaway!!!! Playing with fun fabrics in my quilting room has brightened my winter considerably! I'm a follower - thank you for a wonderful giveaway! On a gloomy day I like cooking and reading. Sou seguidora,obrigada por abrir internacional. Reading a good book. Thanks for the giveaway. On a grey winter day, what cheers me up more than anything is a call from my sis! A good laugh will always bright my day. Watching my children live their lives always brings a smile to my face. Even on the gloomiest of days, I can rely on them to cheer me up. Thanks for the chance to win! Oh wow, what beautiful fabric! We have more than our share of gloomy days in the Pacific Northwest, although today is a sunshiny one! When we do have gloomy days, I like to play peek-a-boo with my aussie shepherds, which always gets me laughing. I also grab some small project to sew and listen to music. Yes, I do follow your blog and am subscribed! A really good book always lightens my day. Thanks for the giveaway. Curling up on couch watching a good movie. Thanks for chance to win. What lifts my spirits would be a great mystery movie, my sewing machine primed and ready to go and (believe it or not) snow falling! A surprise phone call or email from a friend! Listening to good celtic music lightens my days. On a gloomy day I get lost in a book! I love to have a warm cup of coffee and a little chocolate! Thanks for the giveaway. I hate dreary days! I'll talk to a friend on the phone or work on my ancestry. Something that absorbs me so the time will pass quickly. Also reading the blogs I follow. I receive your posts by email. Chickadees - these little black capped birds come to my feeder jabbering away in any kind of weather. They make me smile even on grey days. I follow you with Google Reader & thoroughly enjoy your posts - thanks. On a gloomy day, a call from one of my kids or grand kids brightens my day......heck, a call from them anytime brightens my day! I follow via e-mail and google reader. When it is a gray winter day, it is always great to go to a fabric store and look at beautiful colors with a friend. If I can't do that, sitting with some hand stitching is a close second. On a gloomy grey day I like to get crafty with the grandkids! Playing with beautiful fabric. Thnx! On gloomy days I like to stay in bed and read a book as long as possible. Sewing and drinking tea always brightens a gloomy day! lol - sewing, of course!! On a gloomy winter day I like to play with fabric! Sorting through my fabric stash brightens any day. Even better if I have a delicious cup of coffee to hand! What beautiful fabric. That ought to brighten a dreary day. Unfortunately, I usually just sit in my chair and sleep lots. I do try to pick up handiwork. It sure helps to make sure the blinds are open and all the light that can, does get in the house. So, usually I do handiwork. I also try to get out of the house that day for sure, weather permitting. It helps to get up and do something rather than dwell on the darkness. I'm a follower. Thank you for being generous in your giveaway. Cooking aand filling thee kitchen with delicious smells! Thanks for the giveaway! I'm a follower. Thanks again! Candles and the AC on ! A gloomy winter day can always be made brighter if my time is spent in my sewing room. It's also lovely to cross-country ski if there's a fresh snowfall. Oh yes, I follow you! On a gloomy day I play with my children - they don't seem to be affected by the weather and are always full of beans! Thanks for the lovely giveaway. 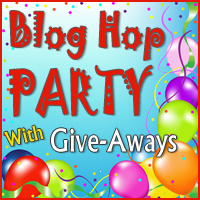 I don't seem to be able to find the listing of all the blogs that are participating in "Blog Hop Party". The Quilting Gallery link doesn't give the blogs; do you know where I can find them? Gloomy days don't last long around my home. My new quilting addiction takes care of them right away! I am hooked on the brightest fabrics I can find. Sounds like the kind of day my friend Jim Beam can help cheer up---seriously it sounded funnier when I thought of it. kidding I love to sew, too. Curling up with a hot chocolate and a good book always makes me happy when the weather is cold and grey. On a dark day, and we get alot in the pacific NW, I love to read a good book or crochet. I follow your email and blog. A gray day without any errands in town equals a quilting day for me - and I don't mind gray days at all! Quilting with bright springtime-y fabrics brightens my mood! A good cup of Folgers and a good chic flick. Quilting is an any day brightener. I love quilting on every day, rain or shine. Thanks for the chance to comment. I love to do hand sewing or embroidery! thanky you! I am a happy follower too! Thanks for the chance to win. I know it is odd but cleaning helps get rid of the blues for me. It is activity and it chases out the old, dusty thoughts and makes things fresh. I was already a follower! Grey or not, snowing, cold, or whatever, getting out for a walk, ski or snowshoe always makes me feel more cheerful. The only thing that deters me is when it is super icy. On a dreary day a good book, cooking, baking or creating something and spending time with my loved ones lightens my mood. I'm a follower of yours, via GFC. A lovely cup of tea, chocolate and a good book. A call from one of my children always lifts my spirits...especially on a gloomy day! Thanks sew much for this chance to win your generous giveaway. Oh, and I'm a new follower! My grandkids always brighten up my winter days - my spring, summer & fall ones too! I will bake my favorite cake. On a gloomy day I love to go to a quilt shop and do some fabric therapy :-) Thanks for the giveaway! On blue days I like to work on a pretty project. I find they are also a great way to relax. I am also a follower via email. On a gloomy day I pick up a quilt magazine to get inspired. I quilt on gloomy days. Working on one of my many ufo's, a movie on the Hallmark Channel and a big pot of homemade chicken and dumplings ;) Thank You! On a grey day, I do NOT try to choose colors--unless I go to a fabric shop or shop online! Usually I curl up by the fire and do some hand quilting. It's grey today so I've lit the fire, put the kettle on and I'm going to sit down and watch the England/Italy (rugby) match! Perfect! On a grey winterday I like to sit with my sewingmachine and do some quilting. Playing with my little dog always makes me feel better. If I can get to the sewing machine, my day gets a whole lot brighter. Spending time in my studio. Quilting is the always the perfect thing to do on a gloomy day.....or any day! Thanks! Hi Denise - I'm following you....around the blog hop as well as by Google. Such fun! The fabric is lovely and I'd love to have it. Thanks for letting us visit. Nothing lifts a gray old day to something like sunshine like a sewing circle with friends, some good food and some warming conversation for a few hours. My favorite mood lifter! What lightens my mood on a grey winter day- I love in Phx.AZ so I LOVE grey days! And they make me want to sew/quilt! Listening to music while quilting brightens my mood! Thanks for the chance. Sewing on a gloomy rainy day makes me feel better. I'm a long time follower too. I'm a new follower... and i like to snuggle under a warm quilt with my warm rice bag and watch a Shirley Temple movie. Gloomy days are great for baking, reading quilt books nd turning on your favorite music and working on your quilts. Thanks for a lovely flowery fabric, we want winter gone, but we are getting snow.. I am a new follower. Now I can keep an eye on your blog. On a dreary winter day I would be either watching movies on LMN or on the computer checking out my favorite blogs to visit and see what they are up to. Maybe a giveway or two to enter and then you will in such a good mood because you just won. Thank you for being a part of this Blog Hop and giving all of us a chance to win that gorgeous fabric. I love working on my charity quilts, brings a smile to my face knowing that what I sew makes a big difference in a ill child or Seniors life. On a grey day I like to bake something. It always picks up my mood and makes the house smell good too! Usually reading my favourite blogs. And cake. Quilting of course! It brightens any day. Thank you for the chance to win that beautiful fabric! And I am a new follower. On a gloomy day I turn lots of lights on and get to sewing with my cup of hot chocolate. Starting a new project, whether it's sewing, cross-stitching, crocheting, knitting--that's what brightens up a grey day. My daughter brightens my day every day - she's learning so fast!